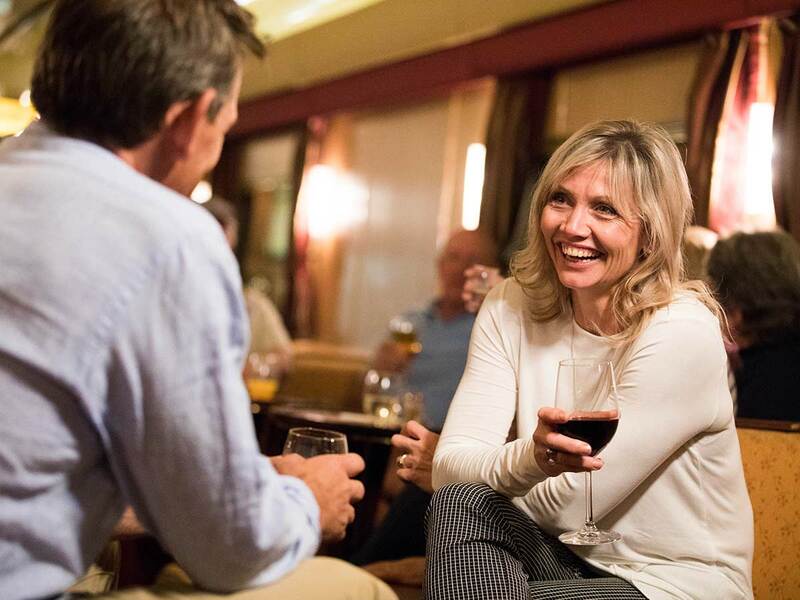 Before even boarding the Ghan, your journey begins on your arrival afternoon in Darwin with a Sunset Dinner Cruise on Darwin Harbour. Step onto the Charles Darwin’s Captains Deck at sunset where you’ll revel in a delectable Australian buffet, prepared with local produce. 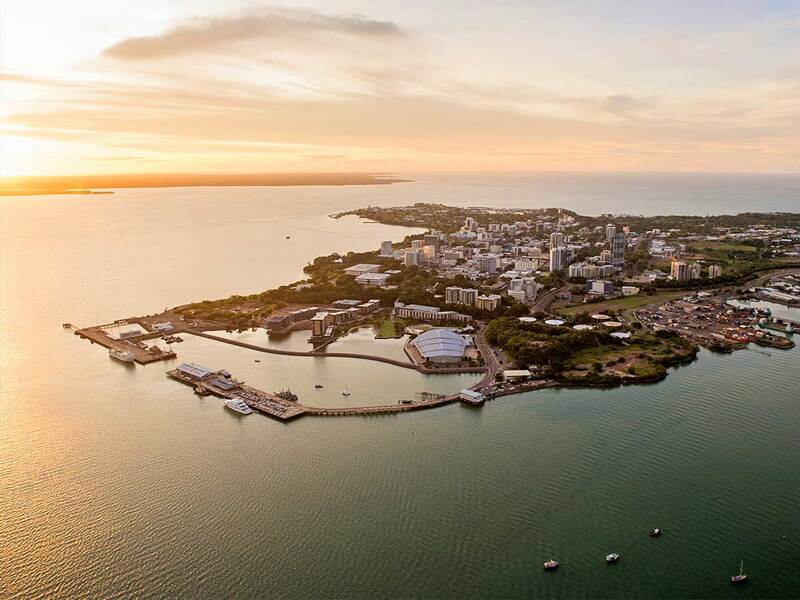 Enjoy a leisurely morning the following day before joining your AAT Kings ½ Day Darwin City Sights Tour. Learn about the city’s fascinating history as you explore the Aviation Museum, East Point Military Precinct, Art Gallery, Botanical Gardens and beyond! 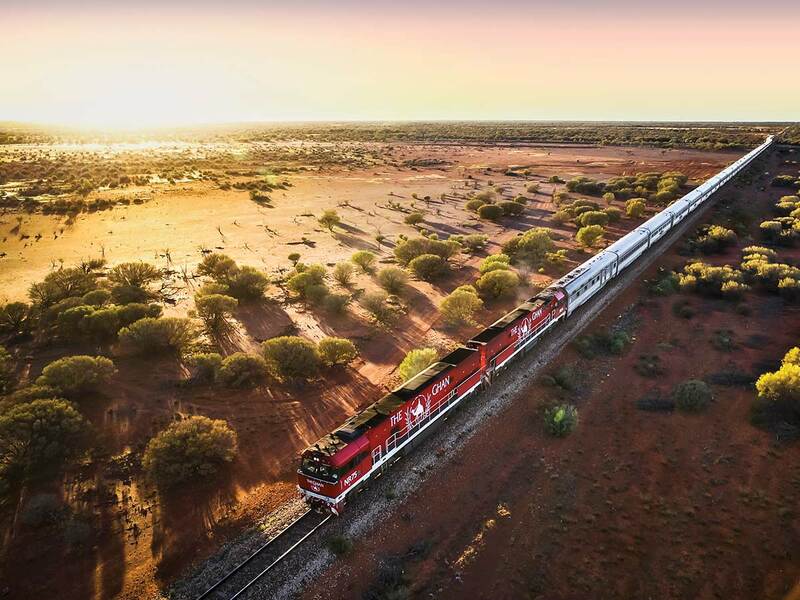 The highlight of the trip The Ghan Expedition a one-of-a-kind experience leads you to some of the most hidden yet charming landscapes that lie between Darwin and Adelaide. City escapes and unique cultural experiences are also key parts of this venture as well as lush accommodation and quality amenities. Your private cabin boasts comfortable bedding, nightly turn down services and captivating, ever-transforming views beyond your window. When hunger strikes, tantalise your tastebuds at the onboard Queen Adelaide Restaurant as the sunsets over the evocative outback. 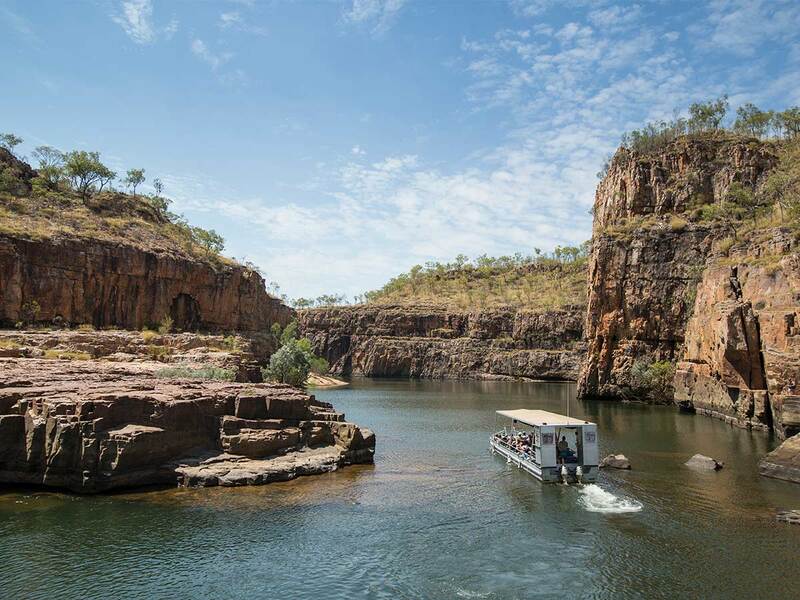 Tour the majestic Nitmiluk (Katherine) Gorge, and get an authentic outback experience with live acts by cattle dogs and talented, passionate singers performing Australian anthems atop stunning horses. Spend an entire day exploring Alice Springs and revel in a guided tour through the sun-scorched opal mining capital of the world, Coober Pedy. Here, you can mine for riches and indulge in a gourmet lunch below the Earth’s surface before gazing at the striking moonscape that is the Breakaways. Finally, arrive in South Australia where beautiful green fields and pastoral lands are aplenty. Cross Barossa Valley or Kangaroo Island off the bucket-list or stay close to the city where you can meander down a myriad of chic laneway restaurants, bars and entertainment venues. 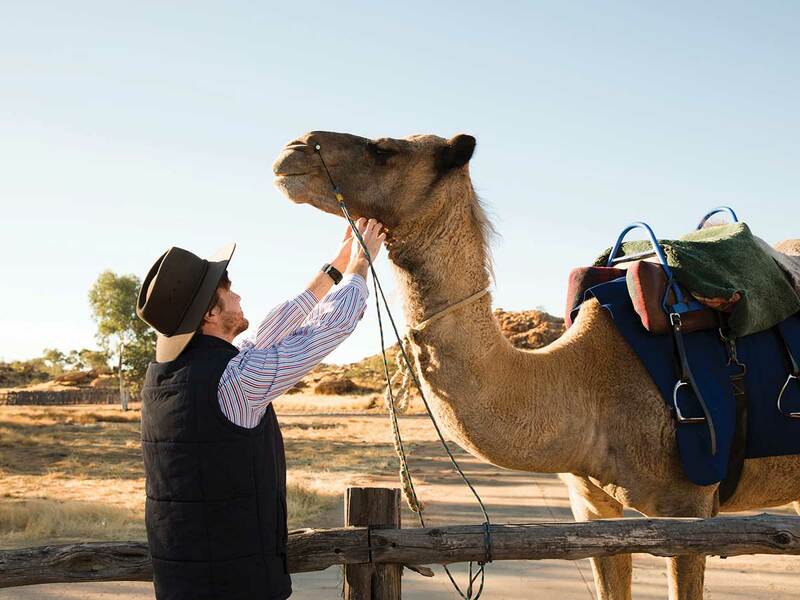 From the ancient sandstone cliffs of Katherine Gorge, to camel treks through Australia’s red centre or to the tastes of Adelaide’s Central Markets, you will experience more of Australia on this unparalleled journey. 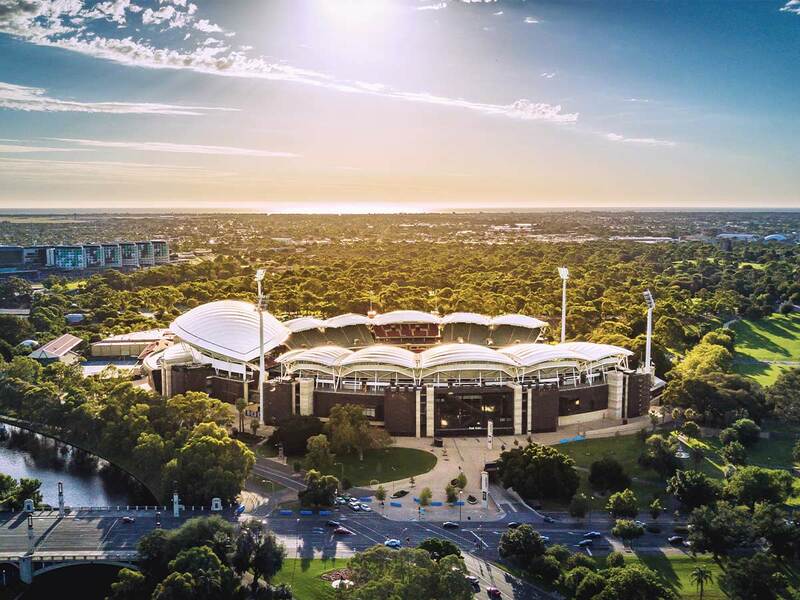 After venturing through Australia’s evocative centre, disembark The Ghan in Adelaide for a short break including an unforgettable Barossa Food & Wine Tour. Uncover South Australia’s most esteemed wine region, sampling the finest vintages accompanied by gourmet culinary delights. This tour also includes a 2-course lunch at stunning Lambert Estate. With rooms and suites that overlook the peaceful Darwin Harbour and Arafura Sea, Mantra on the Esplanade Darwin is the ideal choice for an unforgettable holiday in Darwin City. This 4-star property is the gateway to enormous, biodiverse national parks and spectacular Outback desert landscapes. Only a short drive from Darwin International Airport, Mantra on the Esplanade Darwin boasts contemporary interior design and coastal ambience on top of personalised services. Start your mornings the right way, with a stomach full of sumptuous breakfast foods. The talented chefs at Mantra on the Esplanade, Darwin put on a fantastic array of choices, so fill up a plate, pour yourself a cup, and fuel up for the day ahead. We know how much Aussie’s love a cold drink. Ease into your holiday and choose from a selection of house wine, beer and soft drink. As the day’s light dims, cast off and head out over beautiful Darwin Harbour. Take a seat on onboard the Charles Darwin’s Captains Deck and let us spoil you with a sunset cruise including dinner. One of the far north’s true underestimated beauties and Australia’s only tropical capital city, Darwin is home to a diverse range of people, sites and sounds. Wander through markets, learn about the city’s role in World War 2, or simply enjoy the atmosphere and warm weather while you discover what makes this tropical city tick. 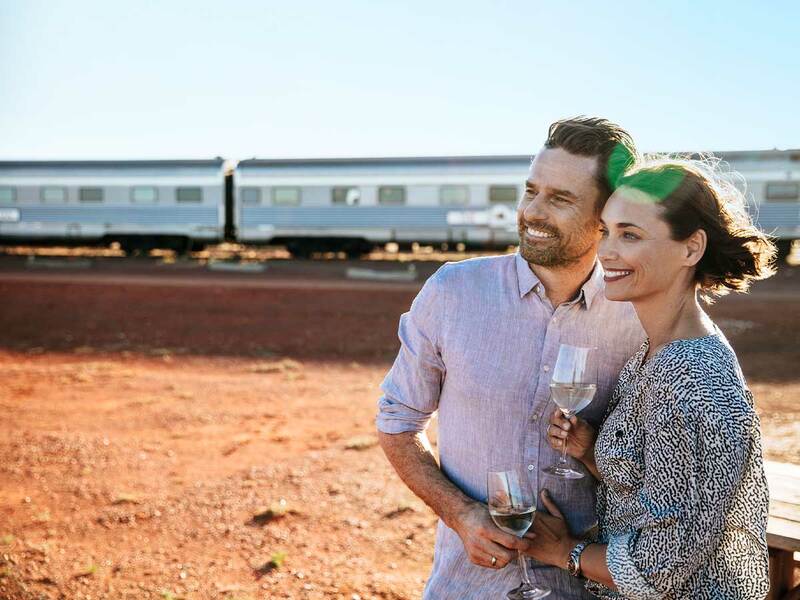 Experience Australia’s gems in style and luxury aboard the legendary Ghan. This 4-day, one-of-a-kind expedition leads you to some of the most hidden yet charming landscapes that lie between Darwin and Adelaide. Whether or not you are a wine lover, Adelaide City has a lot to offer. This small city is oozing with charm, sophistication and natural beauty. Touring around is like a breath of fresh air and when it comes to superb accommodation, look no further than 5-star Peppers Waymouth Hotel. Start your day with a delicious breakfast that will provide you with the fuel you need for a day full of activities and relaxing! Two guests will enjoy the delicious array of locally sourced foods for free while feasting on a buffet breakfast each morning. Settle into holiday life straight away. Forget worrying about your bags, or carrying them around. Check-in early, unpack then unwind. There’s so much to see and do when you stay at Peppers on Waymouth Hotel, and we don’t want you to miss a minute of it. Two drink vouchers daily at Peppers on Waymouth for a selection of house wine or beer. One drink just not enough to quench your thirst? No problem! With this exclusive 7travel extra, you’ll receive not one but two vouchers daily for a selection of house wine or beer! Undeniably iconic, the unforgettable Full day Barossa food & wine experience. Tour. Uncover South Australia’s most esteemed wine region, sampling the finest vintages accompanied by gourmet culinary delights. This tour also includes a 2-course lunch at stunning Lambert Estate. Wake up to magnificent cityscape or harbour views when you book this accommodation. This air-conditioned room is perfect for leisure travellers because of its up-to-date facilities, including workstation, internet access and deluxe bedding configuration. The large windows also allow sunbeams to naturally light up the room. For your complete enjoyment, this accommodation also has a large LCD TV with Foxtel channels, an iPod dock, minibar with light refreshments as well as tea and coffee making facilities. To ensure maximum comfort, the room is furnished with King, Queen or Twin bedding, a luxurious bathroom and a love seat. During the day, the compact Twin Berth Sleeper Cabins offer a comfortable three seater lounge, converting to an upper and lower sleeping berth at night. And with top notch service from our hospitality attendant, you’ll enjoy fresh sheets, bath towels, pillows, doonas and complimentary toiletries. Twin Berth Sleeper Cabins have private en suite facilities with a hide-away compact toilet, wash basin and shower and are equipped with power outlets and In-cabin music channels and journey audio commentary are available. A stylish room designed with European flair, this accommodation offers a refined luxury unlike any other. In this spacious Deluxe Room with contemporary amenities, your small family can enjoy an idyllic stay. Eat, sleep and chill however you like…revel in a glass of bold Cabernet Sauvignon while taking pleasure in the scenic cityscape from your private balcony. Catch your favourite local shows on Foxtel HDTV while feeling cosy on King or Twin bedding. Sunbeams naturally light up the room through its floor-to-ceiling windows. Also, the room features a loveseat, work space and Wi-Fi. The gorgeous marble bathroom comes with separate bath and shower areas. How do I make a booking once I have purchased a 7travel voucher? Customers will need to contact the 7travel team. When you contact us to make your booking, we will endeavor to book and confirm all components of your package within 72 hours of receiving your booking details. Should we not be able to confirm any component, we will contact you with an alternative within 72 hours. For further details regarding the booking process please refer to our full Terms & Conditions (use the link at the bottom of this page). Can I purchase travel insurance through 7travel? Yes you can purchase travel insurance. Please call 1300 297 577. The Australian Government advises that all travelers obtain travel insurance prior to travel. The insurance should cover loss of deposit and other monies through cancellation, loss or damage to personal baggage and loss of money, medical expenses, additional expenses to cover hotel accommodation and repatriation costs to Australia should any services need to be extended or curtailed due to illness or other insurable risks. Our reservations team can provide you with general information about travel insurance at the time of booking. If you do not require travel insurance, you agree to provide written acknowledgement that a recommendation to obtain travel insurance has been made to you by us. You can visit the 'Availability' tab which has live, up-to-date availability. Simply select a date in the calendar above the availability grid. For airfare availability, please contact 7travel on 1300 297 577. If I want to travel on a particular date but haven’t purchased a 7travel voucher, can the booking/room be held for me until I have purchased the voucher? Your booking is subject to the availability of the actual rooms provided by the resort for the 7travel promotion. This allocation of rooms is well in excess of the rooms required to satisfy the offer, however, not all rooms available at the resort on any given day will be available to guests participating in the promotion offer. Please note that booking available rooms is on a First Come First Served basis. No. Bookings/voucher redemptions and availability checks must be made through 7travel. I haven’t received my 7travel voucher yet. What do I do? Please call the 7travel team on 1300 297 577. Where can I find full terms and conditions for 7travel? Single Supplement available from $325 Based on land only in a Hotel Room City View and Deluxe Room. Single Supp for The Ghan Expedition only available for travel June/July. 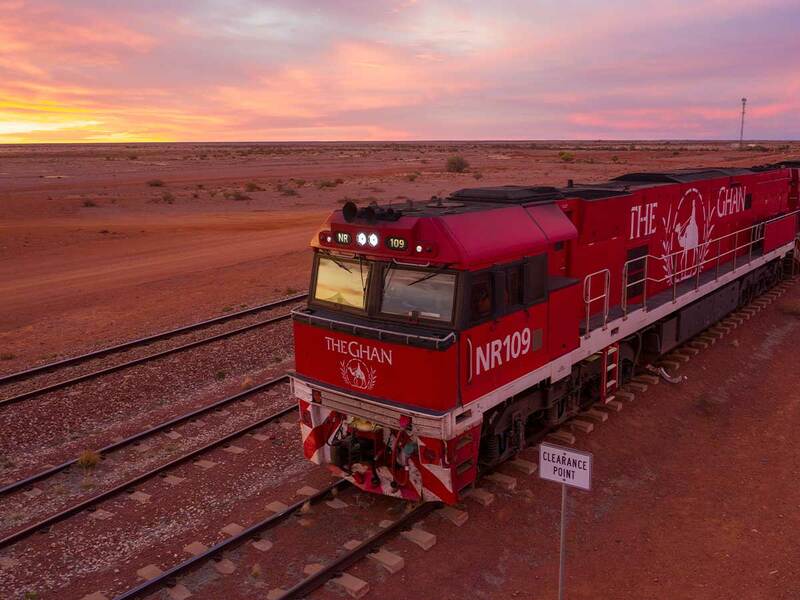 Direction of Travel: Darwin to Adelaide only (The Ghan Expedition) only. ^Guaranteed availability on selected travel dates only. Restrictions & conditions apply. See website for full terms, conditions & travel dates. Please ask us for further details or visit our website at www.7travel.com.au. 7travel provides holiday packages offered by Ignite Holidays Pty Ltd & is a subsidiary of Ignite Travel Group. ATAS Accreditation No. A10345.